When Leia and Yoda were tiny puppies, they would share everything. When we were little, we shared everything. As Leia has grown up, however, she has become a territorial terror, bullying and bossing around her brother. Have you had similar experiences with your multiple-dog households? For the past few years, Leia has been crying, squealing, and pacing around any time we took her for a coveted “ride in the car.” She doesn’t seem to be carsick, and we couldn’t figure out what was wrong with her. As a little puppy, she used to curl up and go right to sleep after about five minutes of “car motion.” I was trying to think about what may have changed. 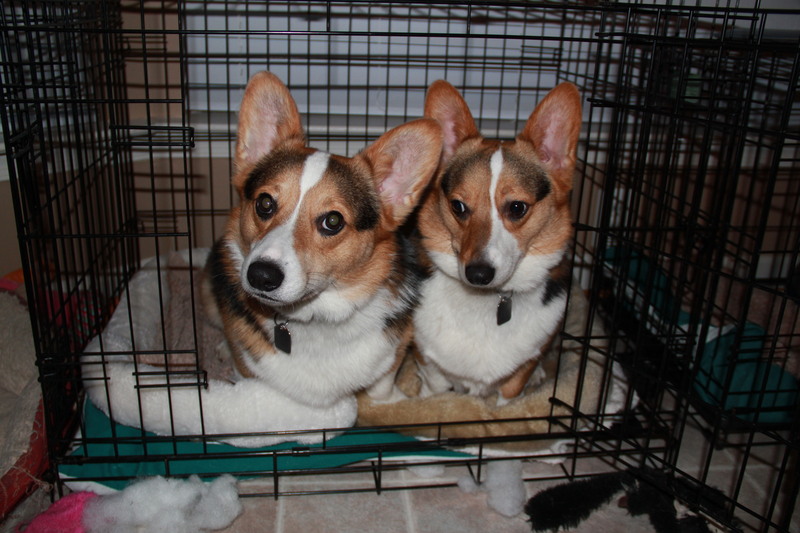 Then it hit me: as puppies, the corgis would separate themselves. Yoda would curl up on the floor behind the driver’s seat, and Leia would stretch out on the entire bench of the back seat. But then Yoda got bigger, and he no longer fit on the floor behind the driver’s seat… he had to take up part of the bench. And that’s when Leia’s growling started. 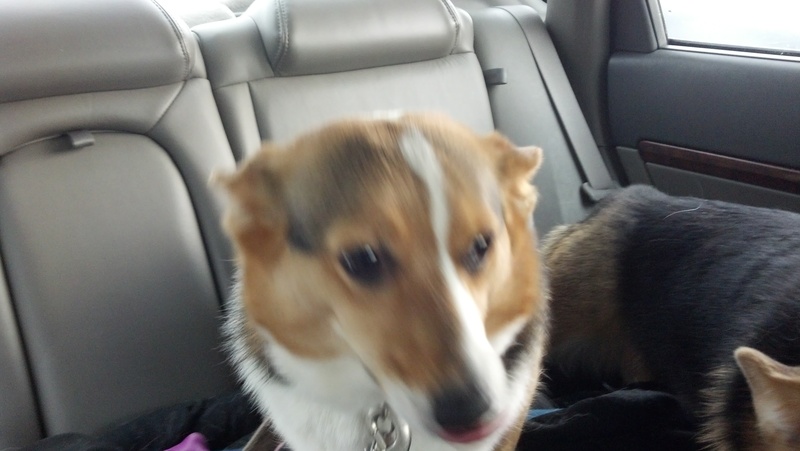 Leia in the back seat moving so fast, growing, and whining that she is a blur in the picture! Notice Yoda is next to her on the back seat. Leia’s ears are also in a fairly distressed position. The epiphany came to me yesterday when I took the dogs with me to the gas station. Leia was doing her usual growing, whining, squealing, and running back and forth, when Yoda did something unprecedented. The passenger seat was empty this time (it’s usually not), and Yoda jumped into the passenger seat, sat down, and curled up. When we got to the gas station, I told Yoda to go back into the back seat. Leia started whining right away. So all that time that I felt sorry for Leia, worried that she might be car sick… it turns out she was just trying to boss her brother, as usual. She was just trying to claim the entire back seat of the car for herself–for Leia, the growly monster, the territorial terror. Posted on December 19, 2013, in inspiration. Bookmark the permalink. Leave a comment.